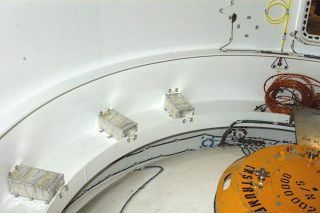 The three packages of DVDs and flags inside the fifth segment simulator aboard Ares I-X. Hundreds of home videos along with thousands of miniaturebanners have been stowed aboard NASA's first test flight of a rocket designedto replace the space shuttle. Their journey onboard the Ares I-X will be loftedby a booster assembled from parts previously flown on 30 shuttle missions,including the launch of the Hubble Space Telescope. Scheduled to lift off Tuesday morning, weather permitting,from a modified shuttle launch pad at the Kennedy Space Center in Florida, the Ares I-X developmentflight test will not enter space. Rather, the two-stage rocket will followa 28-mile-high, five-minute flight profile while more than 700 sensorsrecord the vehicle's performance. Only the Ares I-X first stage, a four-segment solid rocketbooster borrowed from the shuttle program and amended with a simulated fifthsegment to replicate the AresI flight configuration, is to be recovered after it parachutes to an oceansplashdown. The second stage, which is made up of mockups including a simulatedOrion crew exploration vehicle and launch abort tower, will be left to sinkinto the Atlantic. As NASA's first opportunity to test a new rocket designed tocarry astronauts to orbit, the primary goal of Ares I-X is to collect dataneeded to validate the agency's computer and wind tunnel models, while givingthe team experience with preparing and handling a booster other than the spaceshuttle, which will be retired over the next year or two. Dubbed the "first flight of a new era," thesymbolic nature of the Ares I-X launch has not escaped NASA's attention. Standing 327 feet tall, Ares I-X is thetallest rocket now in service, rivaled only by the U.S. Saturn V and SovietN-1 moon boosters last flown in the 1970s. Giving Ares I-X much of its height is its upper stage builtfrom steel "tuna can" rings stacked atop each other and topped byempty replicas of the capsule and escape tower that would support an astronautcrew. Although it is to be lost at sea, this upper stage simulator (USS) alsocarries the most visible markings identifying the rocket as part of NASA's newConstellation program in the form of four six- foot emblems. Positioned under an equally large American flag decal andbelow the NASA insignia are three emblems designed for the space agency bygraphic artist Mike Okuda, who is perhaps best known for his design work onmultiple "Star Trek" television series and movies. Though not thefirst of his emblems to fly on a spacecraft, Ares I-X will be the first vehicleto fly emblazoned with Okuda's Constellation, Ares and Ares I-X logos. "I can't tell you how proud it makes me to helprepresent all the men and women who have worked so hard on this program andthis flight test," shared Okuda in an e-mail to collectSPACE.com. "Honestly, Inever expected to see any of these emblems on actual flight hardware, and itwas a real thrill when I first learned that they'd be on this vehicle." While the other logos may go on to fly on other rockets, atthe bottom of the line of emblems is the blue, red, yellow, gold and whiteinsignia that Okuda specifically designed for Ares I-X. "The emblem is an attempt to illustrate the tremendouspropulsive power required for space flight," he said of his design,which features a view from below Ares I-X as it lifts off. "[It] isintended to resemble the Ares project logo. However, the Ares I-X mission patchuses a circular background shape, to distinguish it from the rounded triangleused for the various [other] Constellation program emblems." Above and behind the insignia decals inside the mockup crewcapsule are markings of a different type, though also intended to represent themen and women who worked on the program. "If you could go inside the rocket, most of the team atthe very top of the crew module signed their name or left a message," JonCowart, Ares I-X deputy mission manager, revealed to collectSPACE.com. "Ithink my favorite one is 'Hello fishies, we come in peace.' So, when this thinghits the water and sinks to the bottom of the ocean, any of the literate fishwill know." Though the team's signatures will be lost to the sea, theywill not be without a memento of their work, added Cowart. "We've also stowed on-board some flags," he said. "We've got enough in there to give most of the team members." The 3,500 miniature banners were packed in the rocket'sfirst-stage fifth-segment simulator, below the parachutes that will slow thesplashdown and enable their recovery. Continue reading atcollectSPACE.com about the historic hardware that Ares I-X is fly atop, aswell as the hundreds of home videos aboard. Copyright 2009collectSPACE.com. All rights reserved.